Blue grama is a native warm-season grass found throughout the Great Plains. It produces palatable forage for livestock and can withstand close grazing. 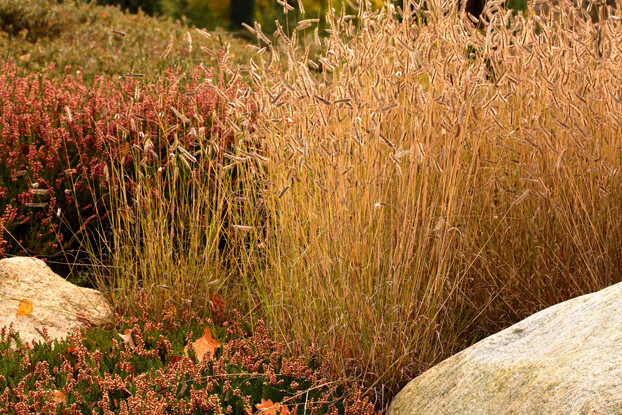 In southern states, blue grama tends to grow as a bunchgrass. In the north it can produce sod and can even be used for low-maintenance lawn. Extremely drought tolerant and able to grow without irrigation in areas receiving at least seven inches of annual precipitation. It grows about a foot tall and prefers well-drained, gravelly soils. Excellent for partnering with wildflowers.